City Mayor Vicente “Dongkoy” Y. Emano arrives @ the CILRAI (Cagayan Integrated Landless Residents Association, Inc.) Open Space in Macabalan where 87 couples await for his free mass wedding ceremony and hundreds of residents get to receive free basic services e.g. 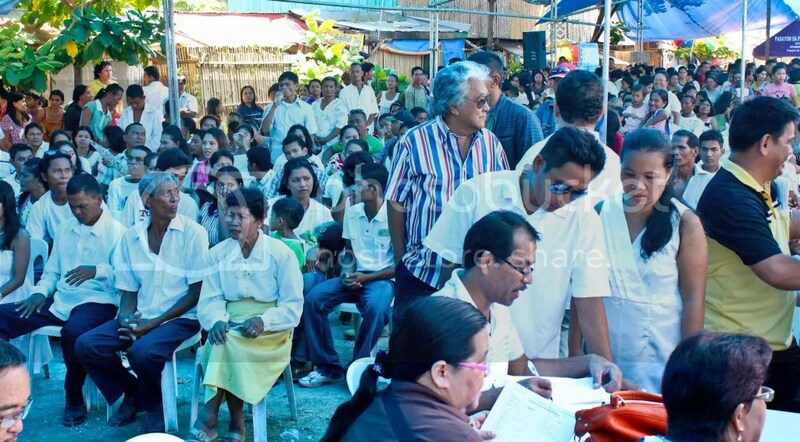 medical, dental, veterinary, including free medicines and rice, and other services offered by the different departments and committees of city hall during its People to People Program last October 31, 2012. 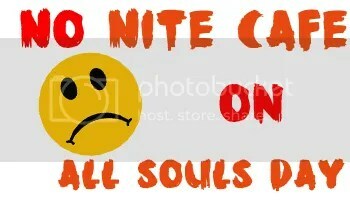 To insure the solemnity of the observation of All Saints Day and All Souls Day, City Mayor Vicente “Dongkoy” Y. Emano has suspended the operation of the Nite Cafe and Nite Market in Divisoria on Friday, November 2. Normal operations will resume however on Saturday, November 3. 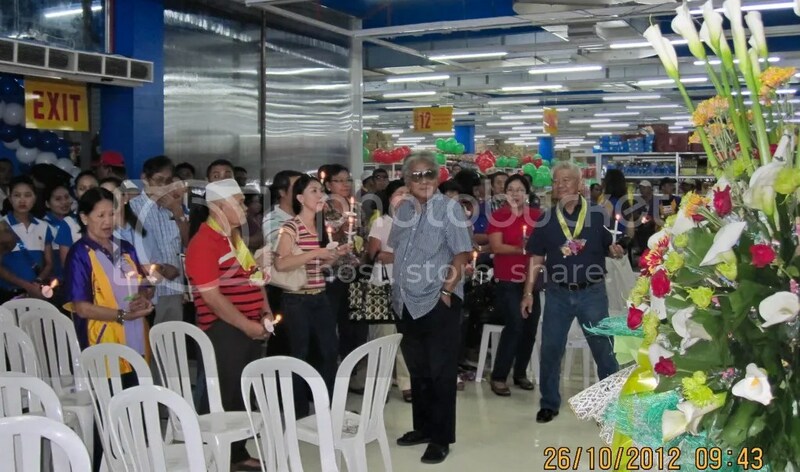 “Ang temporaryong pag-undang sa Nite Cafe and Nite Market karon Nobyembre 2 subay sa gipakanaog nga kamandoan gikan sa buhatan ni Mayor Vicente ‘Dongkoy’ Y. Emano,” Acting City Administrator Wilma Polley-Rugay, the chairperson of the Divisoria Nite Cafe and Nite Market Committee clarified. To help make the observation of All Souls Day peaceful, City Mayor Vicente “Dongkoy” Y. Emano calls on the public for support and cooperation by abiding with traffic rules and cemetery regulations. This, after the mayor released an executive ordinance ordering the implementation of appropriate traffic re-routing schemes in the various cemeteries in the city. 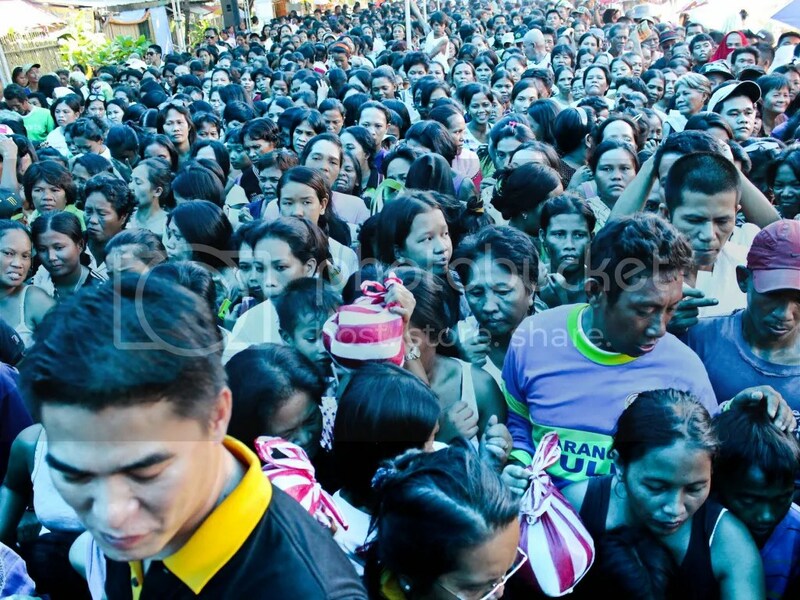 “Hinaut nga paluyohan sa publiko ang atong lmga paningkamot aron dili magsi-ot ang dagan sa trapiko, ug usab malikayan nga ma-perwisyo ang atong mga kaigsoonan nga mobisita sa mga sam-ang. Subli, naga-hangyo ako sa tanan nga likayan ang pag-sugal, pag-inom sa alak, pagsaba-saba ug pagbitbit sa mga ginadiling mga armas,” the mayor appealed. In behalf of the people of the city of Cagayan de Oro, City Mayor Vicente “Dongkoy” Y. Emano sends warm greetings to Ka Eduardo V. Manalo, Executive Minister of Iglesia ni Cristo (INC), who is celebrating his natal day today, October 31, 2012. “Sama sa miaging mga katuigan, ako, uban sa akong pamilya, mga kauban ug tibuok katawhan sa dakbayan, malipayong naga-duyog sa kinabag-ang ginsakopan sa Iglesia ni Cristo sa pagpahinungod sa kasaulogan sa adlaw’ng natawhan ni Ka Eduardo V. Manalo,” the mayor affectionately expressed. 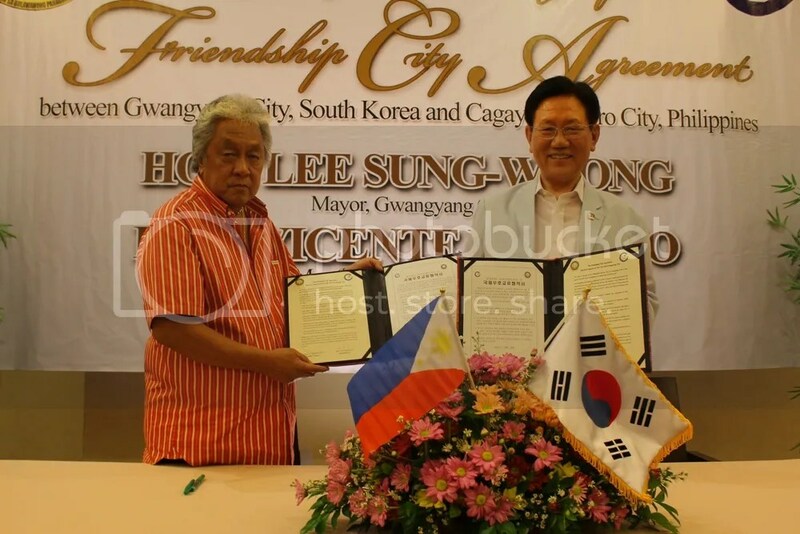 Cagayan de Oro City Mayor Vicente Y. Emano and Gwangyang City Mayor Lee Sung-Woong of South Korea formally signed on Oct. 29 at the Mallberry Suites Hotel here the ‘Friendship City Agreement’, forging the sisterhood relationship between the two cities. 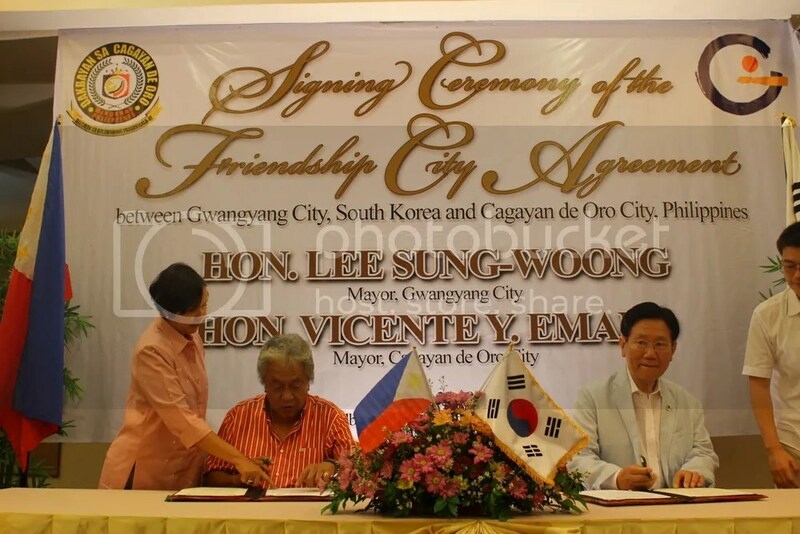 Shortly after signing the ‘Friendship City Agreement‘, CdeO City Mayor Dongkoy Emano and Gwangyang City Mayor Lee Sung-Woong of South Korea pose for posterity holding their signed documents. 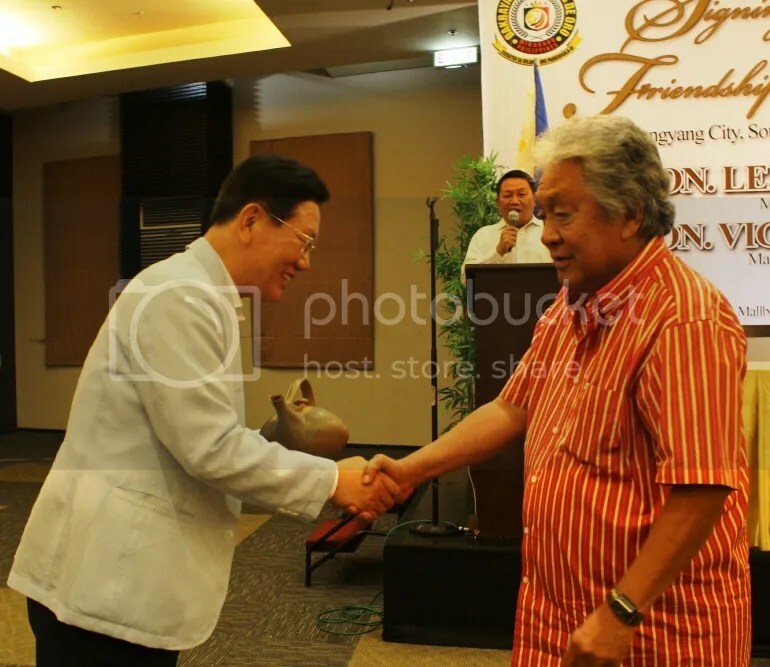 Gwangyang City Mayor Lee Sung-Woong of South Korea presents a porcelain vase to City Mayor Vicente Y. Emano as a ‘gift of friendship’ to the people of Cagayan de Oro. 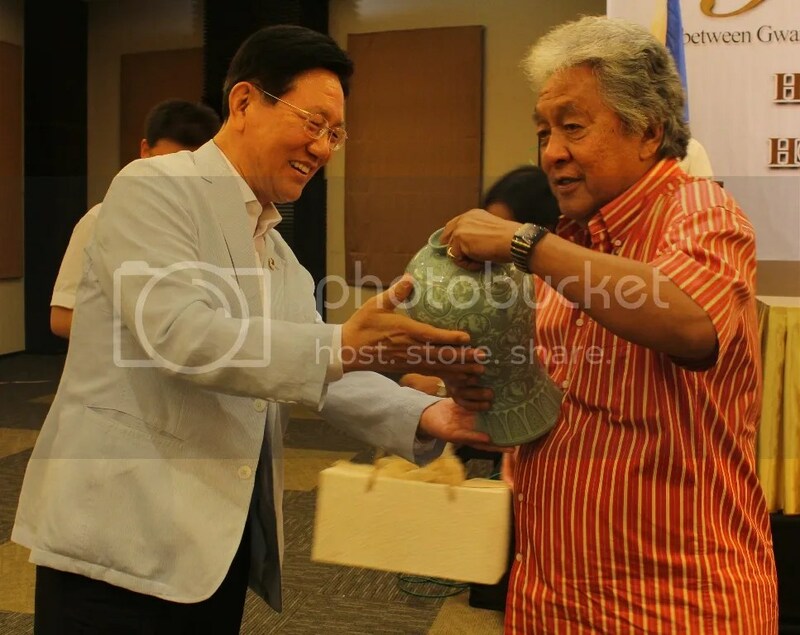 Gwangyang City Mayor Lee Sung-Woong of South Korea gladly accepts a ceramic pot handed over by City Mayor Vicente Y. Emano as a ‘token of friendship’ from the people of Cagayan de Oro. City Mayor Vicente “Dongkoy” Y. Emano is calling all Cagayan de Oro City residents who have not yet registered or are wanting to change their registration with the Commission on Elections or COMELEC to visit the City Tourism Hall and have their registrations processed. The COMELEC had decided to use the Tourism Hall as an extension to their office due to its wider area than can accommodate an anticipated huge volume of registrants. “Hinaut nga inyo kining pahimudsan nga kahigayonan diin nagtanyag ang COMELEC og satellite registration dinhi sa Tourism Hall hangtud Oktubre 31 aron usab dili makawang ang inyong mga katungod sa pagboto ning umaabot eleksyon,” the mayor clarified. The mayor also reiterated a warning that flying voters who willfully register in more than one place shall be meted out a corresponding penalty, e.g. imprisonment. 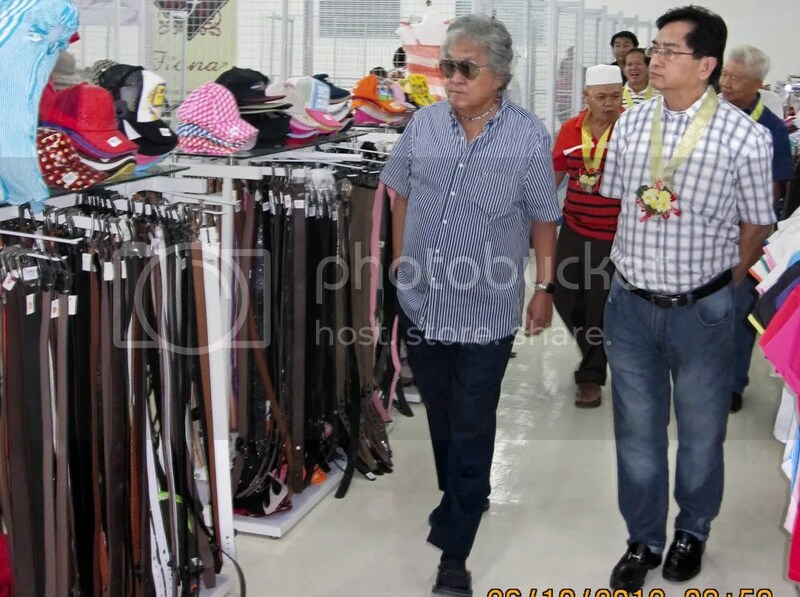 City Mayor Vicente “Dongkoy” Y. Emano takes a tour around the premises of UNITOP in the 2nd and 3rd floor of the Cogon Public Market after cutting the ribbon during its official opening last October 26, 2012. The upper floors of the Cogon Public Market had undergone renovation these past few months in preparation for the operation of the UNITOP, a store that sells all sorts of wares: from personal effects to home appliances; from children’s toys to automotive tools, etc. 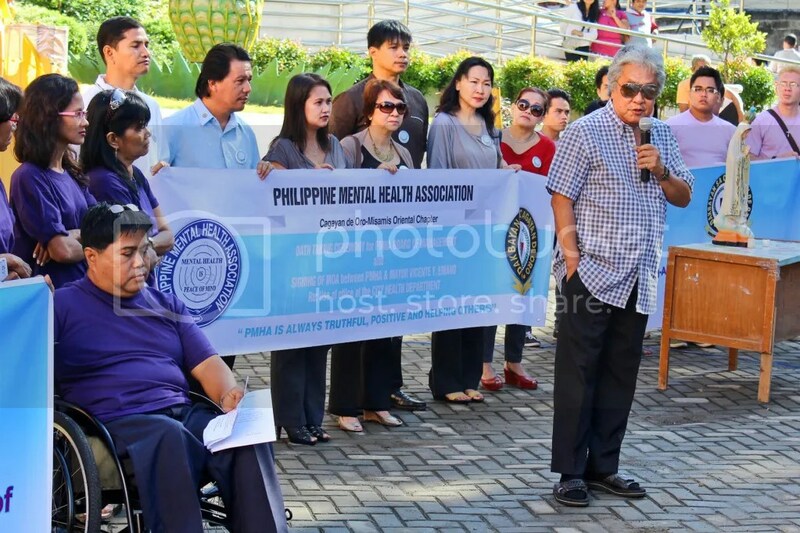 City Mayor Vicente “Dongkoy” Y. Emano delivered a brief message after giving the oath to the Philippine Mental Health Association (CDO-Mis Or Chapter), the Cagayan de Oro Federation of Differently-Abled Persons, the Cagayan de Oro Federation of Day Care Parents Committee, and the Pag-asa Youth Association of the Philippines (CDO) . What matters in the leadership of an association “…is the intention of trying to work together to serve and help those who need help”, the mayor stated as he pointed out that associations should not be influenced by pride or politics in whatever form or shape. 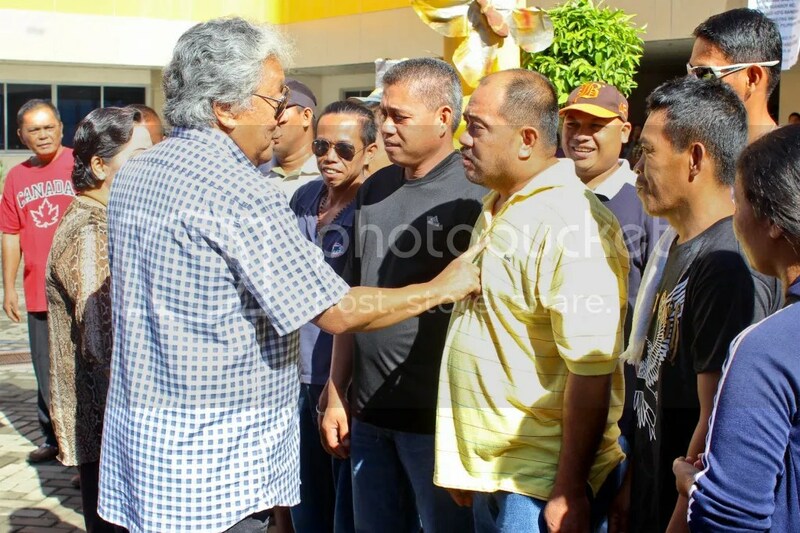 City Mayor Vicente “Dongkoy” Y. Emano congratulates and chats with the selected recipients of 21 calves during City Hall’s flag raising ceremony, October 29, 2012. The calves are to be awarded by the Department of Agriculture – Regional Field Unit 10, headed by Director Lealyn A. Ramos, to these selected recipients who are all survivors of typhoon Sendong from Tibasak, Biasong, and Tambo.